Wondering what to get an elderly relative as a gift this year? Perhaps the emotional needs of an older person in your family have changed, and they are feeling a little lonely? Maybe caregivers are feeling a little stressed at the amount of attention required by the senior? Here is the robotic cat – all the companionship with none of the responsibility of looking after a pet in a person’s senior years. 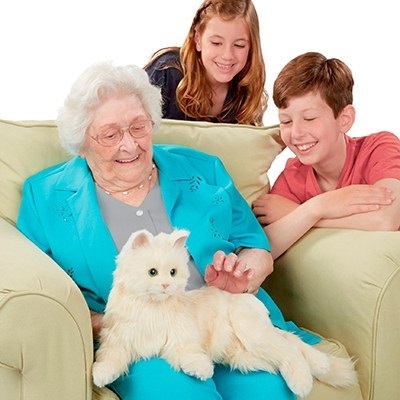 The Joy for All line of robotcats from Hasbro is the latest in elderly high-tech technology that makes for an excellent companion for our senior citizens who want a little more in their lives – nuzzling and purring included. The robotic cat is the first in Hasbro’s line of Companion Pets, and the technological cat has joined the ever-growing number of robots that have been designed to meet the emotional needs of an elderly person. For instance, in Japan, robots have already been tasked with keeping seniors safe and helping to relieve the burden human caregivers often feel. What’s more, in airports around the country, older employees are making use of robotic exoskeletons to assist with lifting heavy luggage. But, back to the robotcat. The cat is incredibly lifelike and genuinely gorgeous – even if you are a dog lover! The elderly technology has been designed to mimic a real cat. Its purring is incredibly convincing, and its meowing is not far off. What’s more, the adorable companion is fluffy and lovely to stroke. When you switch the cat on, it’s almost instinct to say “hello!” and from there onwards, it morphs from gadget to loving pet. For a senior citizen who may not have much company, what could be more relaxing and joyful than having a pet? Pet the robotic cat and it is so lifelike it will nuzzle right into you. Rub its belly, and it’ll roll over, encouraging you to keep rubbing. Pet the back of its head, and it will purr delightedly. Leave it alone for a couple of minutes, and it will close its eyes for a little catnap. When you want to wake the cat up for company, all you do is gently rub its back. Currently, Hasbro sells the cats in three varieties: Creamy White Cat, Silver Cat with White Mitts, and Orange Tabby Cat. They are relatively affordable, too, at $99.99. Research suggests that there is a significant benefit in providing senior citizens with companion robots, in particular for those suffering from Alzheimer’s or dementia. Many people had cats when they were younger, so the robots offer interactive memory, too. According to Hasbro, they do have plans to add more animals to their line, hopefully even for dog lovers. The use of a robotic cat to meet the emotional needs of an elderly person is completely safe. In fact, the only risk is a melting heart at the sight of a furry new friend!